Get beyond the basic notes and rhythms, and music notation quickly becomes a complex affair. Specialization on this level transcends “advanced” or “beginner” categories as each player, each genre, has specific needs. A notation package may be called upon to do everything from creating exam questions for a music class to rendering a score as MP3 playback. The challenge is to deal with all this complexity, while freeing the user to be musically expressive. Finale is an old standby of notation software on the Mac, and as such, its musical capabilities are broad and deep. Traditionally, many users have perceived the software as erring on the side of complexity and power rather than ease. But a series of updates that fine-tune details in the way it handles entry and lays out music, coupled with expanded tools for learning and high-quality playback, have smoothed some of Finale's rougher edges and kept it competitive. In Finale 2011, improved handling of staves and lyrics enhance the way scores look as you create them and when they’re printed. Other additions simply bundle more content in the package, including expanded sound playback libraries, educational worksheets, and specialized percussion and solfege fonts. Finale 2011’s basic editing interface will look familiar to any previous user. To contend with the array of possible notations and editing parameters a score may require, Finale provides an arsenal of specialized tools, presented in toolbar icons and menus. This design approach is both Finale’s great advantage and disadvantage. To new users, the quantity of choices can be mind numbing; it sometimes seems each tool was designed separately with slightly different dialogs, editing metaphors, and click behaviors. That can lead to frustration when performing simple tasks, and the user interface, both visually and functionally, seems several generations old. On the other hand, you don't lack for control: once mastered, these tools free you to adjust almost any parameter on a score. Also new in this version is a simple, printed user guide to aid the uninitiated; getting up to speed on basic editing, at least, is a one-evening affair. Finale 2011 opens with the army of tools and icons familiar to existing users, but streamlined features make them friendlier than before. Lyrics entry now works seamlessly when typing into the score directly, and lyric display, spacing, and syllable extensions look close to perfect without adjustment. If you do want to adjust the output, the floating Lyrics window includes some powerful editing options. Finale’s most significant rival, Avid’s Sibelius, has a more streamlined appearance and entry method. But Finale has also learned from some of Sibelius’ strengths as the two programs have engaged in a game of feature leapfrog. Finale’s entry methods now include some of the keyboard entry and dynamic feedback that once were Sibelius’ alone, while Finale’s developers have made score elements easier to edit. Never overlook bread-and-butter features: improved lyric entry could well be a reason to buy Finale 2011. Lyrics now function the way you would expect, and are nearly always readable and well spaced without adjustment. Entry is more dynamic, too: as with Sibelius, you can simply type in lyrics directly under notes, adding spaces to extend syllables. Word extensions (the underlines that appear after syllables) now display perfectly. In true Finale fashion, when you do want to make fine adjustments, nearly every element of the lyric can be edited with graphical handles. That’s great for engravers and perfectionists, but for most, the ability to avoid this kind of tweaking is a big plus. I was very impressed with the output: it’s taken a long time, but Finale’s lyric display is now among the best anywhere, without any user intervention. It’s also easier to manage multi-part musical scores, including hiding and showing staves (as you might in order to hide parts with large numbers of rests), moving and reordering staves, and managing brackets and groups (as on orchestral scores). Some of these features have already been added to Sibelius, but they’re welcome and well implemented here. Graphical dragging is often at odds with logical engraving rules—that’s a nice way of saying it’s far too easy to drag staves on top of one another—so you may need to do a fair bit of manual adjustment. But it is usually possible to achieve the layout you want. You can add these improvements to extensive additions in Finale 2010, including improved chords, numbering and rehearsal marks, and percussion. The cumulative impact is that entry is quicker, and editing is more satisfying. Finale 2011 includes a number of improvements outside the notation engine. Teachers and students will find hundreds of flash cards, worksheets, and educational materials. These can be used as-is for a decent grounding in theory, musicianship, and even jazz improv, or they could serve as templates for instructors wanting to produce their own materials. 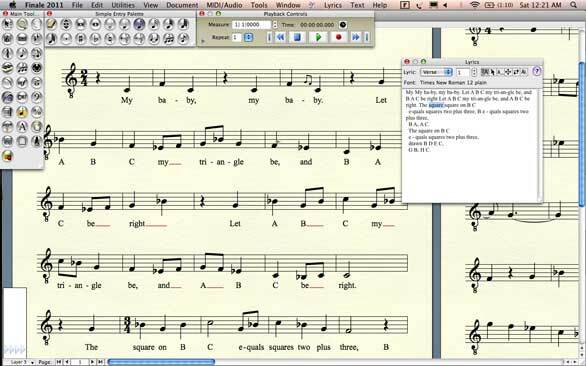 Aside from printing out the worksheets, anyone with a copy of the free Finale Player software can interactively view and play them on a Mac or PC, complete with live synthetic instrumentation. There are also folders full of editable, public domain, and Classical music repertoire. If you’re learning or teaching music, Finale 2011 ships with an extensive score library ranging from worksheets and flashcards to full pieces of music. 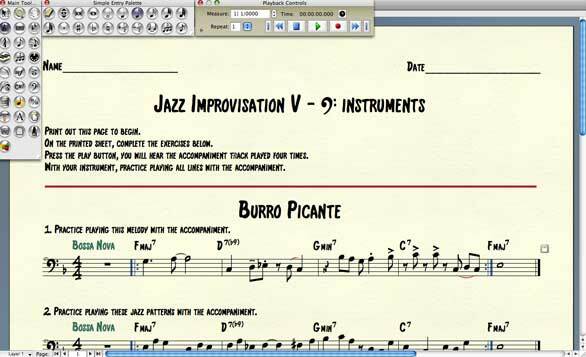 There’s even a new extensive set of exercises for learning jazz improvisation, which show off an attractive handwritten font introduced in Finale 2010. Finale boasts what is probably the most sophisticated set of sampled sounds to ship in-box with any notation software, by offering especially advanced integration of Garritan’s Aria music engine. Building on incremental changes in each annual release, Finale 2011 includes new sounds, an updated player, and a more natural-sounding reverb. If you have a couple of gigabytes of disk space free for the sounds, you can produce high-quality audio from scores. This release also adds new fonts and tools for percussion, solfege syllables for sight-singing and education, mallet notation, and capo chords and guitar frames for guitar, atop an especially attractive Broadway copyist font introduced in Finale 2010. Finale's ambitious annual upgrade cadence can make it hard for existing users to determine when to upgrade, but Finale 2011 is a comparatively easy choice. If you use lyrics, you should upgrade even if you're using Finale 2010, and users of older releases will find the latest Finale more usable while producing better output. For those not yet using Finale, the choice is more personal. Finale and tools like it have an easy edge over general-purpose tools like Apple's GarageBand and Logic; a more complete editing toolset and wider notational range mean that even for beginners, they may save time. Once you're ready to invest, it's worth considering Finale alongside Avid's Sibelius and even the open source Lilypond, each of which produces fine output. While Finale 2011's myriad tools and toolbars may be daunting, it remains a tool capable of satisfying an extraordinary range of musical needs, and its recent enhancements to score output are pitch-perfect. Broad, deep range of notational features. Easier entry and perfect rendering for lyrics. Better management of multi-part scores. Useful bundled scores and exercises for education. Score editing doesn’t always follow musical logic.